Earlier this week, Sumner Redstone sold his majority stake in Midway Games at a substantial loss. He took $100,000 and the assumption of debt in trade for an investment he spent more than $500m accumulating. The decision, many believe, was made in part to help with ongoing negotiations to restructure an $800m loan held by his National Amusements company. Turns out, however, his sales decision may force Midway’s management to renegotiate some debt of their own too. The Chicago area game company is currently carrying more than $150m in senior convertible debt due in 2025 and 2026. The contractual agreements for these loans, according to SEC filings, included repurchase obligations that are triggered by a material change of control. Redstone’s sale of his 87% stake is just such an event. As a result of the Redstone sale, Midway has twenty days to notify its noteholders that they have the option to seek repurchase of their notes. The noteholders, in turn, will have thirty days to respond. 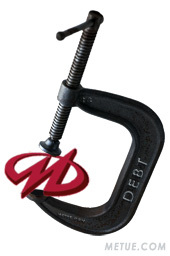 If repurchase is demanded, Midway will be forced to be pay each noteholder seeking redemption the combination of their entire principal investment plus accrued interest. If this happens in mass,which Midway says in the SEC filing they expect will happen, the situation will be dire. Midway doesn’t have much money. In the quarter ended Sept 30, Midway reported a $76 million loss on revenues of just $36.7 million. As of October 31st, they had just over $10m in cash. Even with hot sales of new games in the holiday season, a large scale repurchase request could bankrupt the company. Further complicating matters, if Midway defaults on repaying these noteholders, additional debt owed to National Amusements (debt which appears to be assumed by the new buyer Mark Thomas as part of Redstone’s sale) could also become eligible for repurchase. It’s not immediately clear the priority of the debtors – that is, who gets paid first in the event of any kind of liquidation. Regardless, for the company it’s a situation clearly going from bad to worse. Midway has been working with Lazard for several weeks and is hoping to find a liquidity solution, or otherwise renegotiate the loans before their hand is forced. Absent that, Midway may not make it very far into 2009.